The country of Sweden has been one among the few monarchies that has lasted for over a millennium, with over 1000 years in the practice of monarchy. As such, in today’s modern day age of democracy, Sweden offers a rare opportunity to watch the live court proceedings of a kingdom. The place offers a first-hand view into the day to day life of the King and the Queen and other officials at the royal palace in Stockholm. It is here that you will find the Skattkammaren, the Royal Treasury. You can find an entry into this Royal Treasury via the route of the Södra Valvet or the arch in the south. The vaults housed in the darkness here, comprise an array of supreme assortment of royal treasuries, ceremonial objects, symbols of office, regalia and insignia to be found in the whole of Scandinavia. It is a gold mine of royal historic heritage. Every item here is of profound historic significance. But some of the most valuable items are the etched sword of state of Gustav Vasa, which hails from the year 1541. In the Treasury, you can also find the grand exhibit of Karl XI’s baptismal font that is made of exquisite antique ornate silver. Even the items used during the coronation ceremony of King Erik XIV, back in the 16th century, in the year 1561, are found here. These items are his original crown, sceptre, key, as well as his orb. The final king of Sweden to be crowned was King Oscar II. His cloak of coronation is also exhibited in the Royal Treasury. In the modern day monarchical rule in Sweden, a crown sits only symbolically, next to the King, on a chair. Other items in display include the historic royal merchandise from the times of the olden royal weddings, funerals, precious acquisitions from wars, and silver baptism fonts etc. 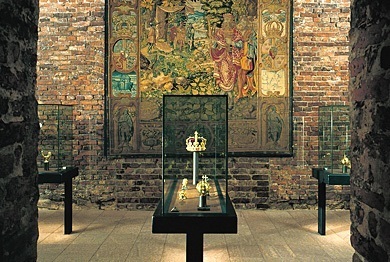 Crowns of Lovisa Ulrikas, and other princes, as well as princesses, are also on exhibit in Skattkammaren (the Royal Treasury), Stockholm, Sweden. Open: 17 Sep – 14 May, Tue - Sun Noon to 4 pm. 15 May - 16 Sep, Daily 10 am to 5 pm. Last updated by Arrnica Dayannandan on 12 December, 2014 in Destinations.